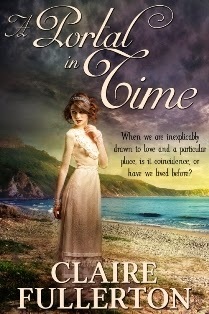 The idea for “A Portal in Time” came from a trip my husband and I took up the California coast to Carmel-by-the-Sea. It was our one year anniversary, and we’d made reservations at an historic hotel. Everything about the lobby of the hotel piqued my interest, and as my husband checked us in, I let my imagination roam, taking in every inch of the opulent lobby with its travertine floors, sand-stone fireplace, and sweeping Mediterranean tiled staircase. As I walked through the lobby, I pretended I was in my own house. I followed a particular hallway from the lobby where sepia tinted photographs depicted people in period clothing beside horse drawn carriages. Beside the pictures were architectural plans of somebody’s home, and as I looked closely, I realized the hotel began as a private residence. Walking up the staircase, a wooden cathedral door loomed ominously at the end of the hall. “Surely,” I thought, “this was once the master bedroom.” I considered the position of the room and decided there must be a window that looked out to the sea. Visualizing myself in period clothing, I imagined standing before the window, scanning the grounds below intently. I believe energy lingers in historic sites, that memory is retained within walls like an indelible record of history. So firm am I in this belief, that on our first night, I tapped my husband on the shoulder at two in the morning. “It’s so haunted in this place, I can’t sleep,” I reported. I ruminated for the following hour, while the story of “A Portal in Time” unfolded in my mind’s eye. could only be told in alternating time periods with an uncanny destination. I wanted to give my readers a paranormal experience, to take them on a journey that could only be reached through a portal in time. “A Portal in Time”(Vinspire Publishing) is available on Amazon.com, Barnesandnoble.com, Overdrive, and Kobo. I read A PORTAL IN TIME, and it is a lovely and compelling tale. The veil between past and present has always intrigued me. Can't wait for the next book from this talented author!